Every year, we wait for their arrival. We binge for six weeks, and then it’s over—back to less festive fare. But how exactly did they arrive in our holiday spreads? Here are the origins behind a few of our favorite holiday foods. The first-known recipe of the sweet treat is said to be from Greece in 2400 BCE. The formula was developed and remixed through several cultures and eventually made its way to England, where Queen Elizabeth I was credited with the idea of decorating the cookies. Eventually, gingerbread was consumed year-round, and the shapes changed with the seasons. The designs got so elaborate that they became a symbol of elegance, which is, perhaps, why we save them for a special time like the holidays. It’s said that Julius Caesar and friends found the British drinking cider in 55 BCE. Europeans brought the tradition to the New World, where cider was such an important beverage that the trees Johnny Appleseed was planting were actually for cider making. In the early 20th century, the combination of improved refrigeration technology and the teetotalism movement allowed humans to drink the unfermented juice of apples, which led to Americans calling an unfiltered juice cider (the rest of the English-speaking world continued to use "cider" to mean an alcoholic beverage, though). Cranberries are harvested mid-September to mid-November, making them perfect to consume during holiday times. Marcus L. Urann first canned the berries in 1912 as a way to extend the short selling season, creating a jellied treat that acted as a sauce when warm. Fruitcakes are just cakes with candied or dried fruit, nuts, and spices. The modern version of the much-maligned dish was likely whipped up in the Middle Ages, when dried fruits and nuts were really expensive. Because of the price of ingredients and the time and effort that went into making the dessert, it's assumed December festivities were felt to be the time most worthy of the hassle. They didn’t always have their stripes! According to legend, the original candy cane, made some 350 years ago, was an all-white sugar stick that was completely straight. In 1670, a choirmaster at a German cathedral bent the sticks to represent a shepherd's staff. The canes were given out to children during a nativity scene. The candy arrived in America sometime during the 19th century, and around that time the refining process for sugar had gotten to the point where it could be pure white, and the development of better food dyes could create that strong red for the stripe. Eggnog has a festive history as a staple for the British aristocracy. It’s based on a medieval drink called posset, which consisted of milk, often eggs, and some form of alcohol like sherry or Madeira. Since all the ingredients were expensive at the time, it became a drink of the wealthy. In the winter, the wealthy would drink warm milk and egg drinks with exclusive spices and liquors. Eventually, people in the American colonies were able to harvest the ingredients from their own farms and the drink caught on again. In fact, the drink you sip around the holidays today is uniquely American thanks to the rum—a critical component of American 'nog which never really caught on with the British upper classes. Americans have been making creamed vegetables, including green beans, since the late 19th century. When cream of mushroom soup was created, it became a common replacement for the white sauce. But the modern version of the dish was standardized by Campbell’s in 1955, simply to promote one of their soups. Smothering things was a trend at the time and the recipe got boxed to the Thanksgiving zone, with no argument from Campbell executives who estimate the company makes $20 million just off cans of cream of mushroom soup around Thanksgiving. The origins of peppermint bark—candy cane bits nestled on top of a half milk chocolate, half white chocolate bar—are lost to time, but the tasty treat dates back to at least the 1960s, when a shop in Florida was offering it (in September!) for $1.19 a pound. But the most famous version of this dish comes courtesy of Williams-Sonoma, which first introduced the candy in 1998; the company only offers the candy during the last 12 weeks of the year. The gourmet food and kitchenwares brand estimates they’ve sold more than five million 1-pound packages in the last decade. Brands like Mrs. Fields and Ghirardelli also sell the treat. The first mention of stuffing meat with something for added flavor appears in a collection of Roman recipes by Apicius. The ancient cook suggested stuffing hares, dormice, chickens, sardines, and squid. Eventually, the concept of stuffing meat with meat was adopted by Europeans—particularly the French. Today, most cooks stick to non-meat fillings. 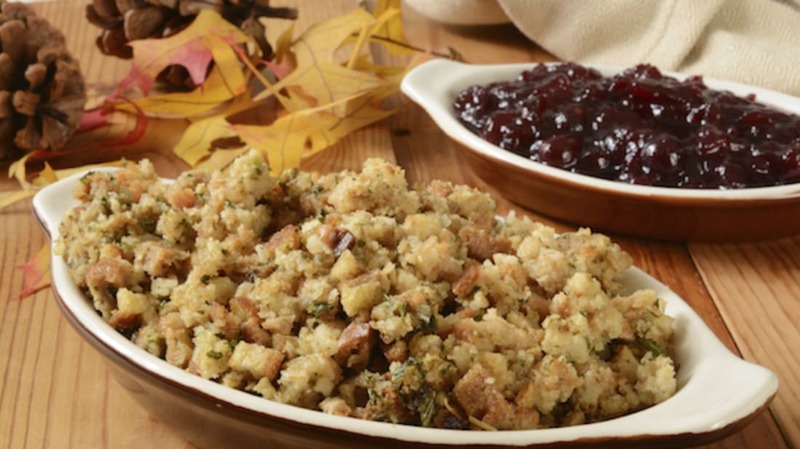 Recently, stuffing has been freed from the interior of turkey bodies and can now be found as a side dish to a big holiday meal, where, depending on geography and many other factors like whether or not it's cooked in or outside the bird, it’s referred to as dressing. It’s really not pudding, at least by American standards. The cake—which contains figs and is topped with brandy—has been an English Christmas dessert since the mid-1600s. Around that time, it was banned by English Puritans because of the large amount of alcohol content. Some believe that a Medieval custom dictated that pudding could only be made on the 25th Sunday after Trinity Sunday and that it was originally comprised of 13 ingredients to represent Christ and his 12 apostles. While interest has waned in Britain, it remains popular in film and carols like "We Wish You A Merry Christmas." Many credit the French for inventing the pecan pie after they settled in New Orleans in 1718 and noticed the abundance of pecan trees. But the first recipes actually appeared in the late 19th century, and were often referred to as “Texas pecan pie.” These were standard custards topped with pecans, not the dark rich filling we associate with the dish today. That was created by the Karo Syrup company in the 1930s when a sales executive’s wife allegedly came up with a “new” way of using corn syrup. In the Jewish tradition, dairy foods are eaten during Hanukkah in honor of Judith, a celebrated heroine who saved her village from an invading army; the original latke was just a cheese pancake. Potato latkes gained popularity in the 1800s thanks to a mass planting of potatoes—which were cheap and easy to grow—in Eastern Europe after other crops had failed. Many different cultures have their takes on the latkes and brought those traditions over to the U.S. to not only help celebrate Hanukkah, but Christmas as well. At the turn of the 20th century, marshmallows were handmade and overpriced. Using the gooey item in cooking was very trendy, but a 1917 recipe booklet by Angelus Marshmallow company really made the idea of using them in candied sweet potatoes stick. Pumpkin dates back 9000 years to Mexico and was cultivated by the Native Americans for centuries. Before modern food preservation methods, pumpkin was roasted or boiled and often mixed with pie-like ingredients: honey and spices. It's suspected that the Pilgrims made a similar dish but without the crust. The Irish definitely get the credit for this. In Irish tradition, the dish was used to celebrate any special occasion—and for a country that is 84 percent Catholic, Christmas would be the occasion. After German, Irish is the most common single ancestry of those living in the U.S., so it's no surprise that the country has adapted some of Ireland’s traditions. What makes beef corned? It’s salt-cured.